Having amassed 20 Grammy nominations, four statues and three Emmy wins, Gordon Goodwin is the most decorated big band leader in the 21st century. After all six of his Big Phat Band albums have garnered Grammy nominations or wins, he’s not elusive about why he trimmed his large 18-piece ensemble for an outing as the 8-member Little Phat Band, which will release their debut album, “An Elusive Man,” on September 9 via the Music of Content label. “It represents another side of my interest in jazz with more emphasis on improvisation and letting the musicians explore things in a way that they can’t do in a larger ensemble. The music I write for this band covers a wide range of styles, from swing to Latin to funk and more. 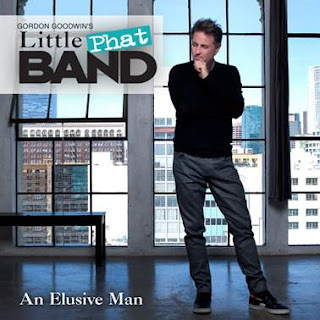 The seven musicians who join me in making up the Little Phat Band are all members of the Big Phat Band and are, to a man, the most accomplished and versatile musicians that I know,” said Goodwin, who produced and arranged the date while composing eight new songs for the ten-tune set. Goodwin’s Little Phat Band – Goodwin (piano and tenor sax), Wayne Bergeron (trumpet), Eric Marienthal (alto and tenor sax), Andy Martin (trombone), Andrew Synowiec (electric and acoustic guitar), Rick Shaw (electric and acoustic bass), Bernie Dresel (drums) and Joey De Leon (percussion) – fills the diverse “An Elusive Man” with regal swing, elegant be-bop and effulgent Latin jazz rhythms along with soulful jazz funk jams. Throughout the collection adeptly balancing serious and somber with playful fun and quirk, astute musicianship is on full display with the players granted more room to bob and weave spontaneously than in the tightly-scripted big band settings to which they are typically confined. Goodwin’s communicative piano ruminations and probing tenor sax explorations carve space to solo as do Marienthal’s roaring tenor and penetrating alto sax, Bergeron’s commanding and eloquent trumpet, Martin’s character-rich trombone, Shaw’s rock-steady bass and Synowiec’s adaptable electric guitar that pierces tunes with expansive straight-ahead and contemporary jazz riffs as well as country licks. Breaking into the industry while still a student at California State University Northridge, Goodwin, a native of Wichita, Kansas, began by writing music for various aspects of the Disneyland park, which eventually led to composing and orchestration gigs in such films as “The Incredibles,” “Remember The Titans,” “Armageddon,” “Get Smart,” “The Sorcerer’s Apprentice,” “National Treasure” and “Gone in 60 Seconds.” His inventive scoring and orchestrations for television garnered three Emmys while his resume boasts crafting music for Quincy Jones, Christina Aguilera, Johnny Mathis, John Williams, Ray Charles, Natalie Cole, Sarah Vaughan and Mel Torme. Longing to forge his own legacy, he formed the Big Phat Band, which debuted in 2000 with “Swingin’ for the Fences,” nabbing a pair of Grammy nominations. Each release that followed cemented the unit’s place as the preeminent big band with Grammy nominations and wins for albums featuring contributions from Eddie Daniels, Arturo Sandoval, David Sanborn, Brian McKnight, Dianne Reeves, Take 6, Lee Ritenour, Patti Austin, Chick Corea, Dave Grusin, Dave Koz, Gerald Albright and Marcus Miller. The group’s most recent offering, 2014’s “Life in the Bubble,” snared four nods along with the Grammy for Best Large Jazz Ensemble Album. Goodwin shares his ardor for the big band sound that first captured his imagination on “Phat Tracks with Gordon Goodwin,” a radio show airing weekends on KJAZZ, America’s jazz and blues station. For more information, please visit www.GordonGoodwin.com.